Step back in time to the city’s golden age, when three grand hotels heralded the birth of Florida as a vacation paradise. When it comes to milestones, it’s hard to beat Florida’s 500th anniversary, commemorating the arrival of Spanish explorer Juan Ponce de Leon on the state’s east coast near present-day St. Augustine. But visitors to the oldest city in the U.S. and epicenter of Florida’s big bash, will discover another, lesser-known anniversary, which may figure as prominently in the state’s history as that long-ago landing: the opening of the Hotel Ponce de Leon 125 years ago. For while the legendary Spaniard claimed and named the state, it was the creation of his namesake hotel by an American visionary in search of new horizons, Henry Flagler, that heralded the birth of modern Florida. 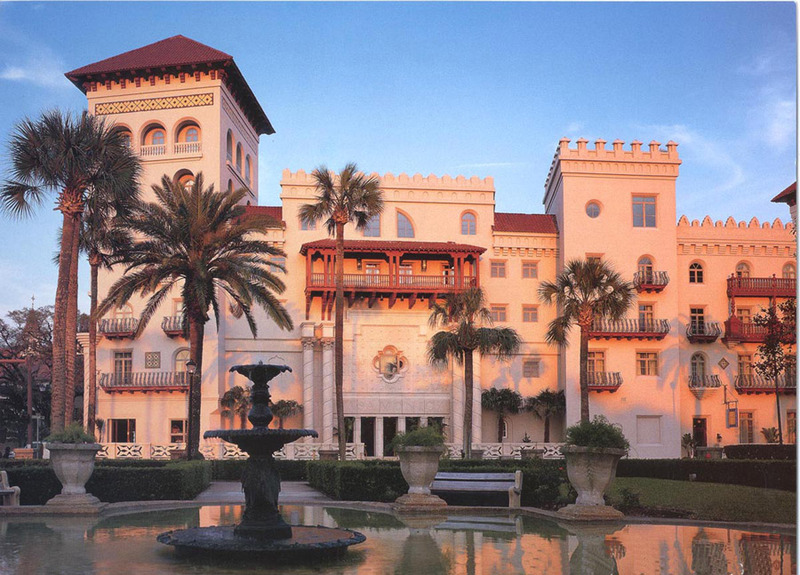 Discover the story behind the Ponce de Leon and her sister hotels, the Alcazar and the Casa Monica, which reigned over St. Augustine during its golden age and marked the beginning of Florida’s rise as one of America’s top vacation destinations. An industrial baron of the Gilded Age, who amassed a fortune as John D. Rockefeller’s partner in the Standard Oil Corporation, Flagler dreamed of creating a “Winter Newport” in Florida, and in 1888, he opened his first of three grand hotels in St. Augustine, the Ponce de Leon. 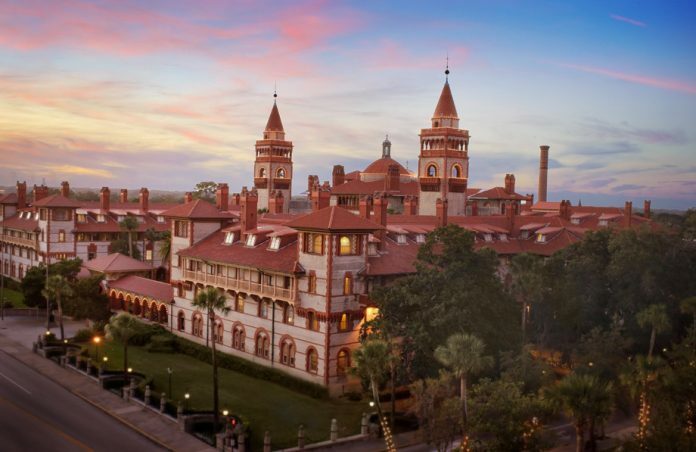 The magnificent Spanish Renaissance resort (now part of Flagler College) once played host to the nation’s social and financial elite, and it’s the obvious starting point on your itinerary. 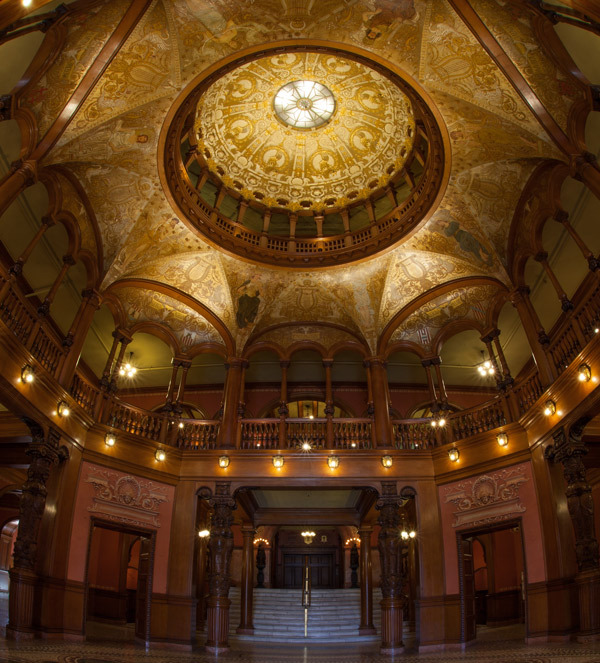 Daily tours begin in the soaring eighty-foot Rotunda, where you’ll learn about the intricate carvings and exquisite murals that dazzled the well-heeled guests arriving for three-month stays. 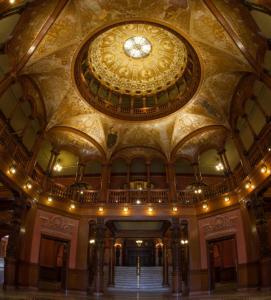 Other stops include the expansive Dining Hall, which is graced with seventy-nine stunning stained-glass windows by Louis C. Tiffany, and the hotel’s Grand Parlor (now the Flagler Room), featuring a massive onyx clock created by Thomas Edison, who provided the resort with electricity and steam power. Before work was completed on the Ponce de Leon, Flagler realized that another hotel, offering more reasonably priced rooms and additional entertainments for his guests, was needed. 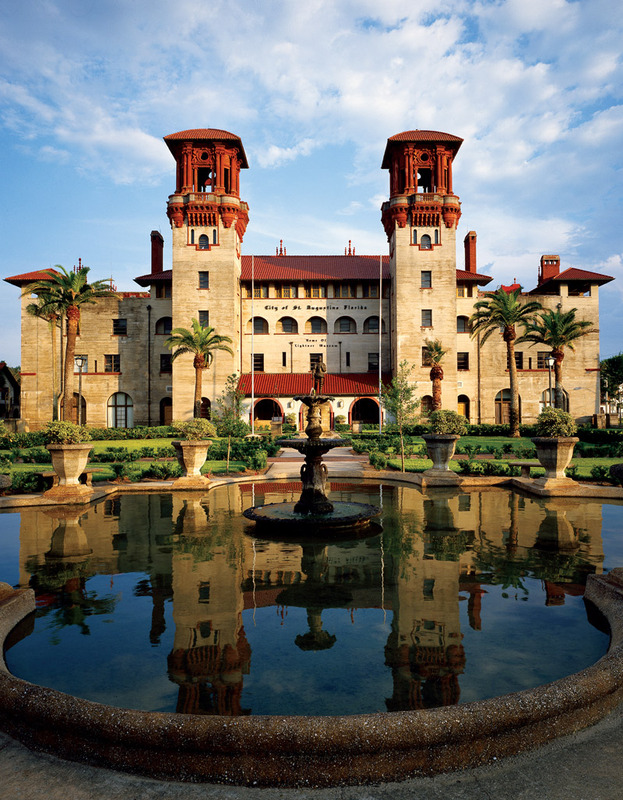 The more intimate Hotel Alcazar, just across King Street, became a beloved St. Augustine institution, and today is home to the enchanting Lightner Museum. 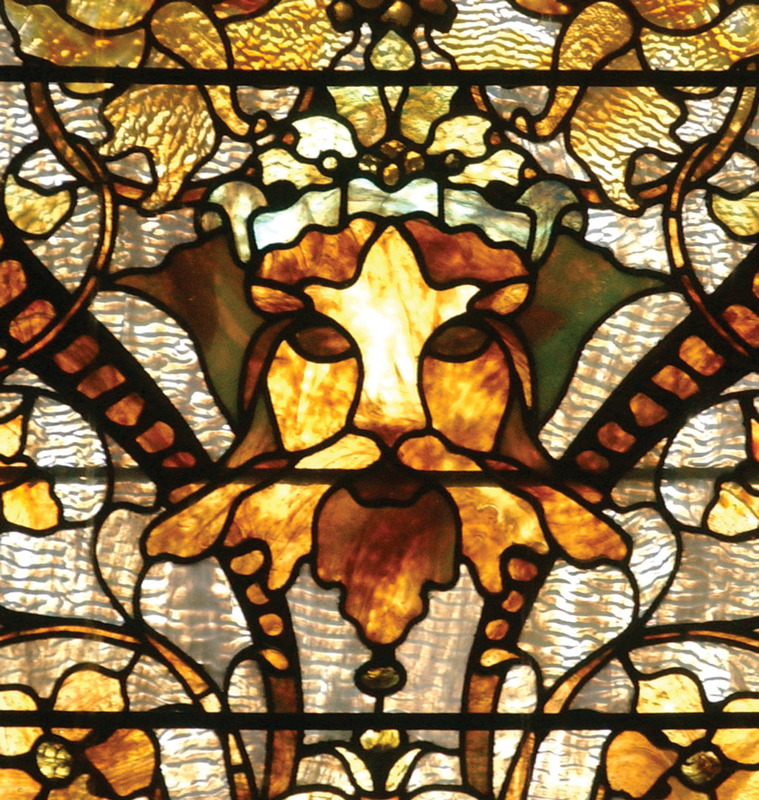 You can easily spend hours wandering through the museum’s treasure trove of Gilded Age relics—from big-game trophies, musical instruments, and period clothing to paintings, sculpture, and fine furniture—which offer glimpses of the good life enjoyed by the hotel’s wealthy patrons. Lunch at the museum’s Café Alcazar is a must. From your table in the deep end of what was once the world’s largest indoor pool, you can easily imagine the thrill of guests as the music of the Ponce de Leon orchestra and Alcazar band spilled down from the mezzanine ballroom and the great glass ceiling, four stories above, was opened for star gazing. Between the openings of the Ponce de Leon and the Alcazar, Flagler acquired a third hotel, the Casa Monica, from a former partner, who had built the would-be rival property adjacent to Flagler’s land. Renamed the Hotel Cordova, its wonderfully wandering floor plan—quite different from the strict symmetry on display in her sister hotels—featured hundreds of rooms, no two of which were alike. Restored in 1999 and reopened as the Casa Monica, it is, ironically, the only of Flagler’s St. Augustine hotels operating as such today. 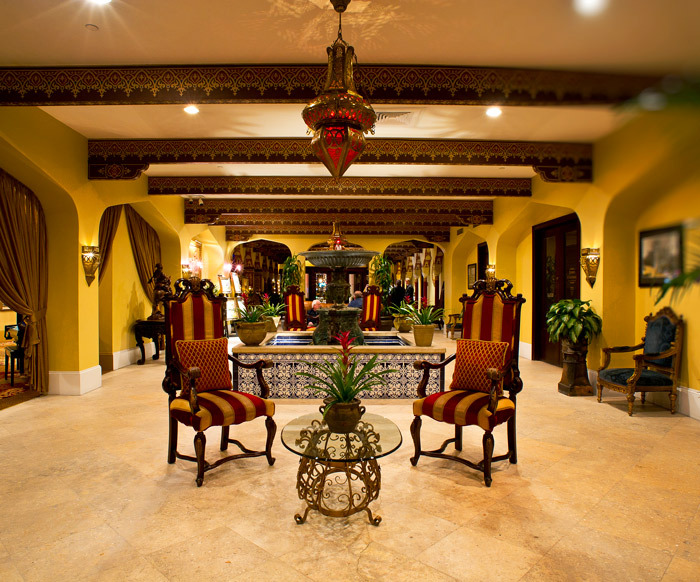 A Kessler Collection Property, the grand boutique hotel offers the finest accommodations in the city, and its Moorish-inspired lobby, featuring dazzling frescoes and tiled fountains, recalls the exoticism and luxury that greeted visitors to St. Augustine more than a century ago. The one-of-a-kind guestrooms are designed in classic Spanish style with dark wood, gold-accented furnishings; plush red velvet headboards; and richly patterned draperies and carpet. Needless to say, if you’re intent on following in the footsteps of Flagler, this is your hotel. Inspired by the success of his St. Augustine triumvirate, Flagler soon turned his sights to south Florida and a new, larger dream: creating an “American Riviera” along the state’s Atlantic coast. Over the course of the next two decades, he would found the cities of Palm Beach and West Palm Beach, construct still more luxury hotels, including the legendary Breakers, and extend his Florida East Coast Railway from Jacksonville to Key West. 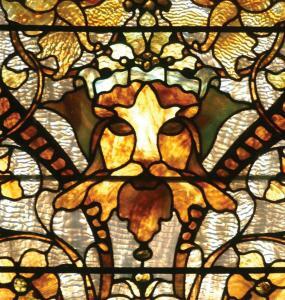 Flagler would also become know as the Father of Miami, for his enormous contributions to that city’s development. As his attentions moved down the coast, America’s elite followed, and St. Augustine’s reign as one of the country’s premier resort destinations came to end. 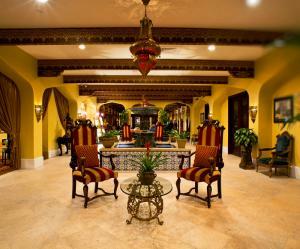 Fortunately for us, Florida’s first city and its three landmark hotels continue to welcome visitors eager to discover for themselves the centuries-old streets and stunning scenery that first inspired Flagler to chart his own “New World” and relive the grandeur that greeted the dawn of Florida’s long—and continuing—day in the sun. 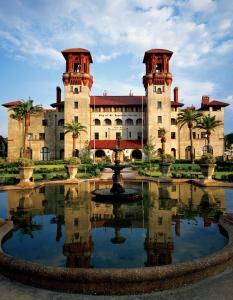 St. Augustine’s newest attraction brings the city’s long history to life in spectacular fashion. The two-acre complex, which encompasses portions of the city’s old Spanish Quarter, showcases three centuries of living history. From the sixteenth-century shipyard to the eighteenth-century pub, every stop on your stroll speaks of the Colonial Quarter’s commitment to authenticity. Founded in 1905 in Tampa’s Ybor City by Cuban immigrant Casimiro Hernandez Sr., the Columbia is Florida’s oldest restaurant. In 1983, the family brought its legendary Spanish cuisine to St. Augustine, opening a restaurant on St. George Street in the heart of the historic district. Diners will enjoy the Old World ambiance, as well as classic Spanish and Cuban dishes. Visitors to the lush mission grounds along the Matanzas River will discover beautiful shrines and statues, as well as an outdoor altar commemorating the first mass celebrated on the site on the occasion of the city’s founding in September 1565. The 200-foot freestanding cross, erected on the 400th anniversary of the mass, is one of the tallest in the world.